New "500" telephone. It has already been introduced on a limited scale and will be put in use as opportunity permits. in places where it can serve best. Note new dial and 25 per cent lighter handset. For years the telephone you know and use has done its job well - and still does. But as America grows, more people are settling in suburban areas. Telephone lines must be longer; more voice energy is needed to span the extra miles. 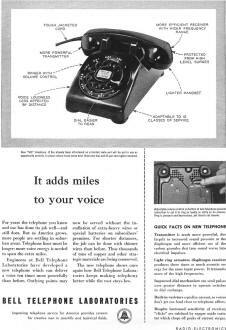 Engineers at Bell Telephone Laboratories have developed a new telephone which can deliver a voice ten times more powerfully than before. Outlying points may now be served without the installation of extra-heavy wires or special batteries on subscribers' premises. For shorter distances, the job can be done with thinner wires than before. Thus thousands of tons of copper and other strategic materials are being conserved. 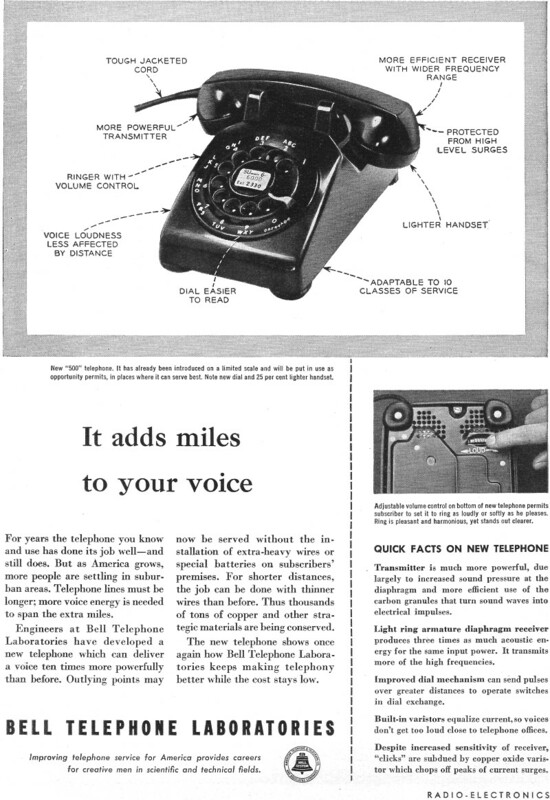 The new telephone shows once again how Bell Telephone Laboratories keeps making telephony better while the cost stays low. Adjustable volume control on bottom of new telephone permits subscriber to set it to ring as loudly or softly as he pleases. Ring is pleasant and harmonious, yet stands out clearer. Transmitter is much more powerful, due largely to increased sound pressure at the diaphragm and more efficient use of the carbon granules that turn sound waves into electrical impulses. Light ring armature diaphragm receiver produces three times as much acoustic energy for the same input power. It transmits more of the high frequencies. Improved dial mechanism can send pulses over greater distances to operate switches in dial exchange. Built-in varistors equalize current, so voices don't get too loud close to telephone offices. Despite increased sensitivity of receiver, "clicks" are subdued by copper oxide varistor which chops off peaks of current surges. 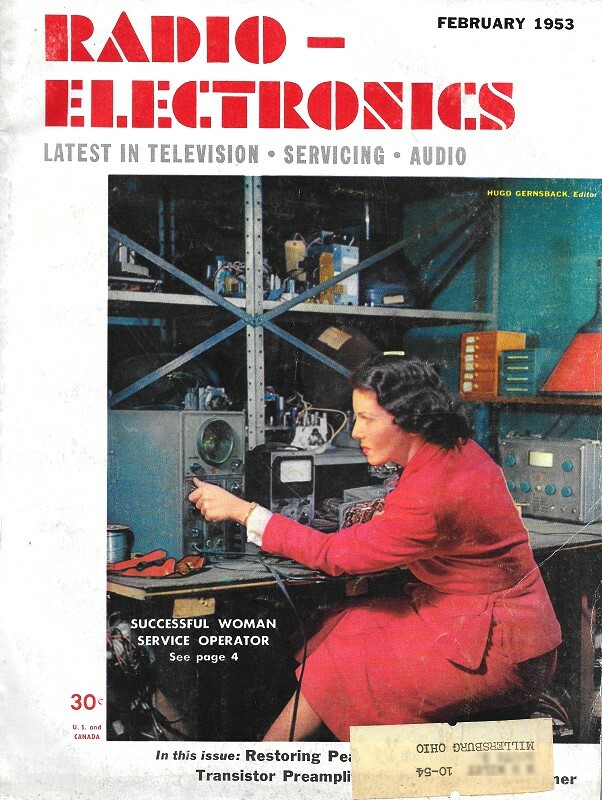 Quiz Answer: The image to the right shows plugs of the sort used with telephone switchboards. The "tip" of the plug physically connected to the "tip" wire on the phone, and the "ring" area connected to the "ring" wire.